1.1. Most registered voters think global warming is happening. Nearly three in four registered voters (74%) think global warming is happening. This includes nearly all liberal Democrats (98%), a large majority of moderate/conservative Democrats (85%), and most liberal/moderate Republicans (70%, an increase of 7 percentage points since October 2017; see Data Tables). In contrast, fewer than half of conservative Republicans (42%, +5 percentage points since October 2017) think global warming is happening. Much of the recent upward trend in Americans’ belief that global warming is happening is due to an upward shift among Republicans. 1.2. A majority of registered voters think global warming is caused by human activities. 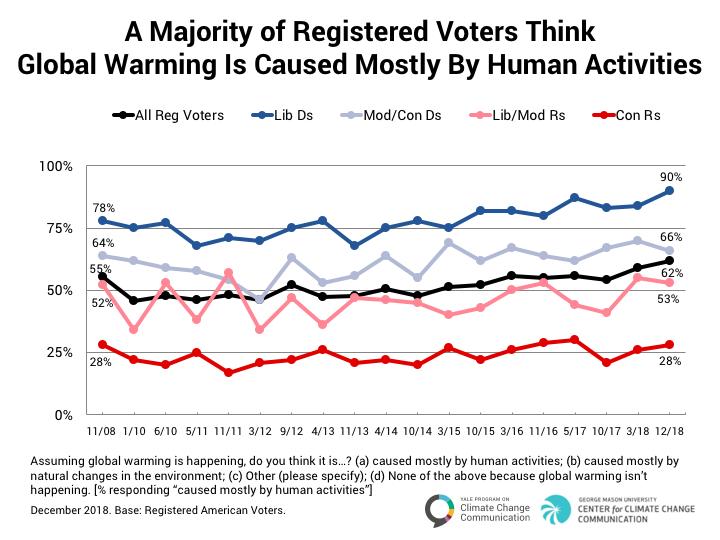 About six in ten registered voters (62%) think global warming is caused mostly by human activities, the highest percentage since our surveys began in 2008 and eight percentage points higher than in October 2017 (see Data Tables). This includes nine in ten liberal Democrats (90%; +7 percentage points since October 2017), and two in three moderate/conservative Democrats (66%). About half of liberal/moderate Republicans (53%) think global warming is caused mostly by human activities, an increase of 12 percentage points since October 2017. Only about one in four conservative Republicans (28%) think global warming is mostly human-caused, but that is a seven-point increase since October 2017. 1.3. 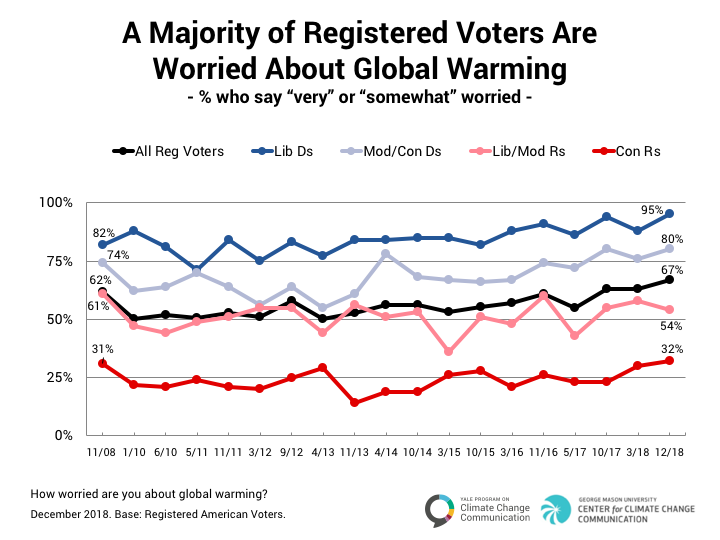 A majority of registered voters are worried about global warming. 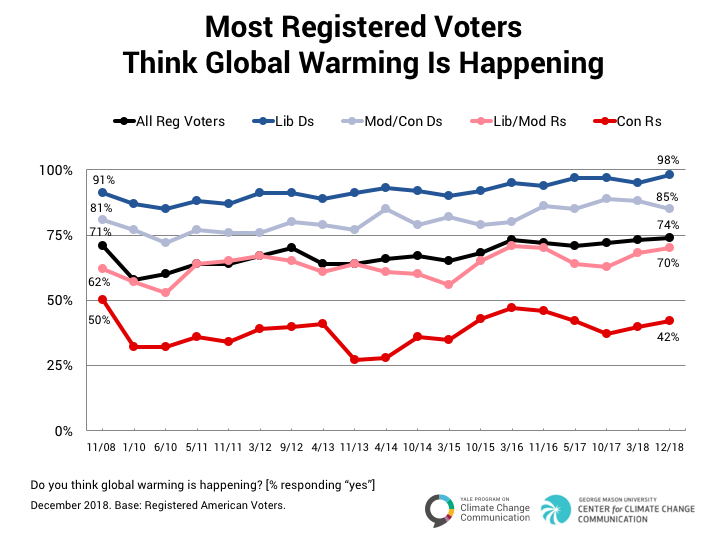 Two in three registered voters (67%) are “very” or “somewhat” worried about global warming, the highest percentage since our surveys began in 2008. This includes large majorities of liberal Democrats (95%) and moderate/conservative Democrats (80%). About half of liberal/moderate Republicans (54%) are worried about global warming. Only one in three conservative Republicans (32%) are worried, although that is a nine-point increase since October 2017 and the highest percentage since our surveys began in 2008 (see Data Tables).